The Greenough River solar farm is installed with 150,000 advanced thin film PV modules supplied by First Solar. Credit: GE Energy Financial Services. The photovoltaic modules are mounted on 16,000 steel poles spread across 124 acres. Credit: GE Energy Financial Services. A worker inserting steel poles at the Greenough River Solar Farm. Credit: GE Energy Financial Services. Project manager Mark Rayner with MLC Philip Gardiner. Credit: GE Energy Financial Services. The installation of solar panels at the Greenough project site began in April 2012. The power produced by the project is fed to the south west interconnected grid. The photovoltaic technology for the Greenough solar facilty is being provided by First Solar. The 10MW Greenough River Solar Farm is Australia’s first utility-scale solar power project when it was commissioned in late 2012. It remained the country’s largest photovoltaic (PV) power station until 2014. The project is undergoing an expansion to increase the capacity by 30MWac. Construction on the expansion or stage two project began in October 2018, with completion scheduled for the second quarter of 2019. The ongoing monitoring is scheduled to be completed by 2020. The project site is located approximately 31 miles south-east of Geraldton, a port city in the mid-west region of Western Australia. The solar plant is producing approximately 22GWh of emission-free electricity annually, which is enough to power 3,000 homes. The solar farm was built to avoid around 20,000t of greenhouse gas emissions annually, the equivalent of taking 3,000 cars off the road. The first stage of the Greenough River Solar Plant was developed by Greenough River Solar Farm, a joint venture between GE Energy Financial Services and Verve Energy, the Western Australian state-owned power utility. Verve Energy later merged into Synergy, who is now the owner of the windfarm. 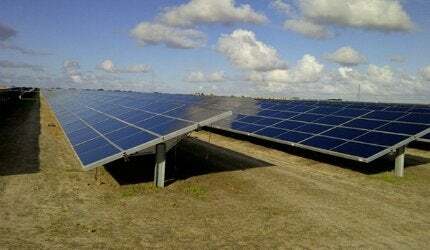 The second phase of the Greenough River solar plant is being developed by Bright Energy Investments. Water Corporation, a Western Australian state-owned utility involved in providing water, wastewater and drainage services in Western Australia, will purchase the entire output of the solar farm to meet the electricity requirement of its recently commissioned Southern Seawater Desalination Plant. The total cost of developing the Greenough River solar project stage 1 was estimated to be approximately A$50m. The Government of Western Australia provided A$20m in funding for the construction of the solar farm. Out of this amount, A$10m had come through the WA Royalties for Regions programme. The project was also supported by Office of Energy and Mid West Regional Development Commission. Greenough River Solar Farm was constructed to help the Western Australia government generate 20% of the total electricity from renewable sources by 2020. A detailed feasibility study was undertaken prior to construction work on the project to assess the social and environmental impacts of the project on the area. In order to get planning approval for the project, Verve Energy had submitted a planning application to the city of Geraldton-Greenough and the shire of Mullewa (both are now part of the city of Greater Geraldton) in the second quarter of 2011. The application was approved in August 2011. This project considered an important step towards the roll-out of larger-scale commercial solar farms in Western Australia. With more similar projects, the cost of renewable energy is expected to come down. The project site is located on the Nangetty Walkaway Road and covers an area of approximately 198 acres of land. The solar panels have been installed in an area of around 124 acres. The PV technology for Greenough River Solar Farm was provided by First Solar, an American manufacturer of thin film PV modules with vast experience in building large-scale solar projects. Using the latest technology, First Solar installed approximately 150,000 advanced thin film PV modules on about 16,000 steel pole mounts. They were installed in such a way that the solar panels get maximum exposure of sunlight to ensure maximum energy production. First Solar uses cadmium telluride (CdTe) as semiconductor for its thin film PV modules. CdTe-made semiconductors are less expensive and generate more electricity under real-world conditions than traditional semiconductors. Around 37 miles of underground electrical cable was used to interconnect the solar modules. Electricity produced by the solar farm was to be fed into the south-west interconnected grid. Energy Made Clean (EMC) officially inaugurated its Carnarvon Solar Power Station in May 2012. Construction on the Australia’s first utility-scale solar farm began in November 2011, with completion expected for late 2012. Onsite construction for structural supports and aboveground electrical work were completed in four months. The installation of solar panels started in April 2012. The solar project was expected to generate almost 100 construction jobs and half a dozen full-time jobs upon completion. The solar panels for the Greenough River Solar Farm are manufactured in Malaysia and transported to Geelong by ship. From here, the solar panels are sent to the construction site by road. The stage two project will include installation of approximately 300,000 additional solar panels that operate on a NEXTracker single axis tracking system. The second phase will add 30MW to the current capacity, and is expected to produce 89,700MWh per annum. It is expected to avoid 60,548t of carbon dioxide per annum, which is equivalent to the power supply to 16,383 homes. Apart from supplying PV modules, First Solar is providing engineering, procurement and construction (EPC) services for the solar farm project. The company is also offering operations and maintenance support since the plant was commissioned. WBHO Civil, a local civil contractor, was hired to provide construction services for phase one of the project. RCR Tomlinson was awarded a $60m contract in April 2018 for engineering, procurement, and construction (EPC) of the expansion project, but the contract was terminated by Bright Energy Investments in November 2018.